Here I want to introduce myself and the story of my dog something more accurate! I, Nina, I'm from the beautiful Lower Rhine and everyone who knows me knows that I just "dog crazy" bin: D (as some call it). Age of 7, I was an absolute dog fan and could pass on any dog! 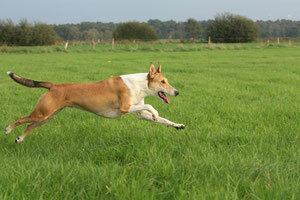 With 8 years I had my first Leihhund "Urmel" from the neighborhood, which I have carried out regularly for a walk. Urmel, a small mongrel time just under 5 years old, has uncanny taught me a lot! With him I only discovered my preference for dogs so right! "Yes, Yes, ... and yesterday you wanted to a rabbit ... then 3 Days to date and then work up to us and we do not want a dog!" I erinner too well the day, I will probably NEVER forget! Grandma came as so often to visit, not to play with me and my sister Ludo. Mom then asked if they could provide us with their own leave, as they would like to drive just shopping. Whereupon Dad said, oh, you know what, I'm having! This struck me before very funny! Approximately 1.5 hours later, both came back inside ... of course WITHOUT purchases what my suspicion that something is wrong indeed confirmed! Mama came into the kitchen and said, Nina, we need to tell you something! "We have a good and bad news for you, what you want to hear first?" "We have bought you a dog - Before you say what now, shall we go?" The bad news was that I went to pick up time point exactly 3 weeks at a holiday camp to Austria and so unfortunately could not share with Laika , the first weeks . But egaaaaal , so I came up with 11 years finally on my first own dog ! After I came back from vacation , began the puppy / young dog school , I made alone with Laika . When Laika was then almost a year old, you had asked me in the club if I did not like would have to work with her on. Thus I came to the THS , I still operate to this day love to ! Long then lived on the desire of a second dog in me. At times I bridged the time then with all Leihhunden or vacation care dogs. But the request was getting bigger and bigger, but unfortunately turned again the problem is that my parents NO WAY a second wanted. Now came the time of my statement and immediately was clear to me, now comes the second! So I went in search of what I want for as well. With Laika as a Border Collie Mix I naturally found the perfect / sly dog sports, something in the direction I wanted to definitely go back. However, it was clear to me immediately, it should be a male and he should be slightly larger. For quite a while I was attracted to the two longhair Collies a Hundeplatz girlfriend, but who definitely too much wool! Then I went in the evening to look through the net. I immediately contacted the contact and promptly even in the same evening I got a really fascinating, long, informative mail back that has been previously totally convinced me really. Like the great information and information of the website. After a bit of mail exchange back and forth, I was even invited to a Kalalassie- "puppy" meetings to come and watch me everything. I have gladly accepted and went there in March 2013 with Laika! Conclusion: There were all more than exceeded expectations! The people, the dogs that residential area, rearing, everything was perfect! Thus, it was clear to me, it is to be a Kalalassie! First of Maja litter had been taken for the beginning of 2014 in the eye, on the one hand, the expected heat of female bee might have been too early for me (because the apartment would have possibly not been available) and on the other I understood it had that the union is already booked to interested parties for now. Thus, I took aim at a puppy for, 2014. Then bee my mind was still only "quite" late in heat, so that the time would have passed, but I yes lt. Probably had to wait.
" Biene is in season - we are looking for prospective dog ! " Then I contacted them immediately ! - With success! She was just as much the I reported how I me that it nevertheless already should rather work now ! Thus, we were shaking with , in the trip to Sweden to the stud , the ultrasound , at birth , to the selection of puppies , etc. Thus we arrived at Conner :) - Kalalassies forty -six golden hugs ! More info about him and the development there on his side !